Dupuytren contracture pictures are a very important part in the education of anyone who wants to know about this terrible hand deformity problem that is characterized by nodules or lumps on palms and one or more contractures of fingers. Understandably, in the early stages of Dupuytrens contracture any person is very worried about the many small – and sometimes large – changes in the hand. Not knowing about a problem is often the worse part of a condition like this. 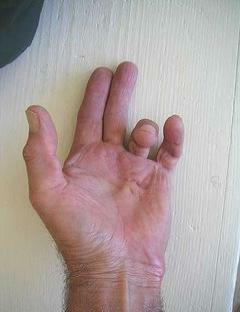 The Internet is used as a fast and ready source of Dupuytren disease pictures. With this in mind, it might be a good idea for the reader to mark this website as a favorite page so that it can be used as a reference for information and support. 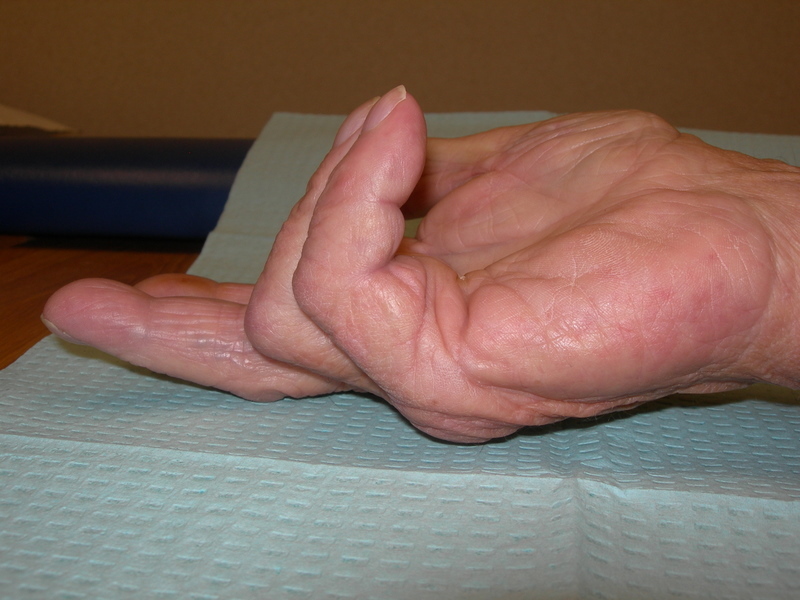 The gallery of Dupuytren’s contracture pictures that follow can be used for general knowledge about the disease process, for comparison to what the reader might be experiencing, or just to see how bad the hand distortion can become. 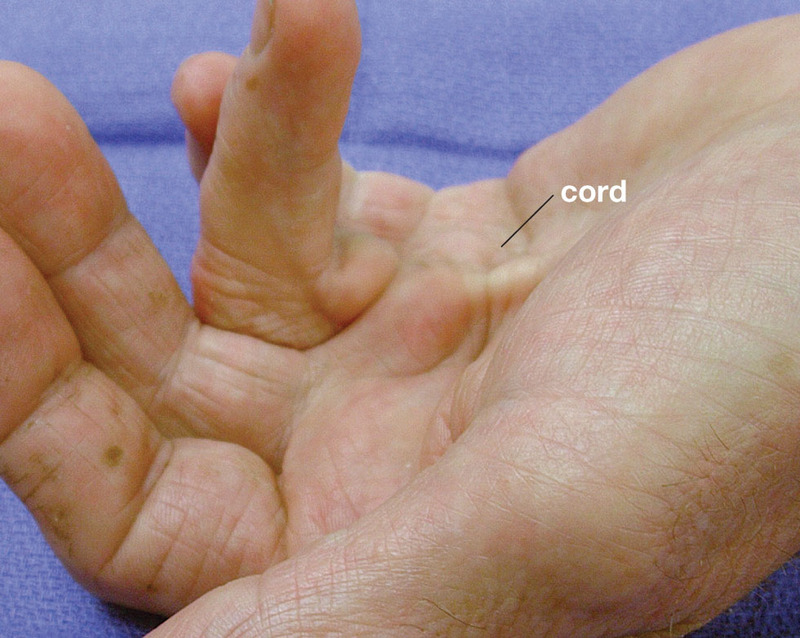 These pictures of Dupuytren contracture are presented for your general education. 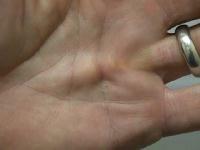 They are not intended to assist in making a diagnosis of Dupuytren’s contracture. If you have not yet visited your doctor to have your hand lumps examined, they are offered to encourage you to seek prompt medical attention and a doctor’s opinion about your problem. Hopefully, after viewing these Dupuytren pictures you will feel perhaps relieved you are not so bad off in comparison to other people’s situation. Please understand that the greatest aspect of this problem is not the appearance of the hand, but how the limited movement and restricted activities reduce the ability of the person to live a full and comfortable life. Before viewing these pictures of Dupuytrens disease it would be a good idea to review some of the basic information about this process. It is important that you keep in mind a basic understanding of the anatomy of the hand, and how the presence of fibrous tissue thickening can result in a lump on the palm of the hand that eventually can severely limit the use of the hand. Dupuytren’s contracture is a painless thickening and shortening of fibrous tissue beneath the skin on the palm of the hand and fingers. 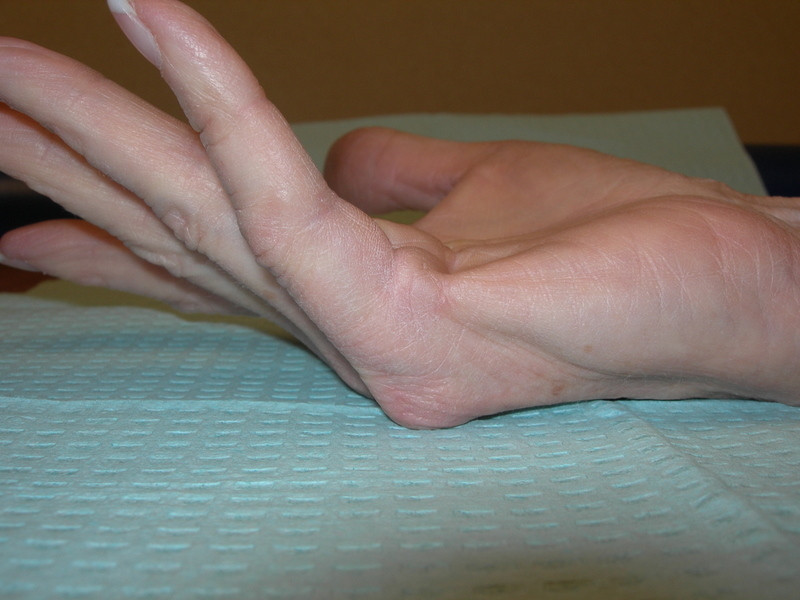 When this contracture is progressive, it may result in a deformity so significant that there is loss of normal use and mobility of the hand and fingers. 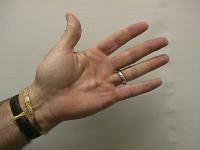 This reduced mobility causes the fingers to bend or flex toward the palm and not be able to straighten out. 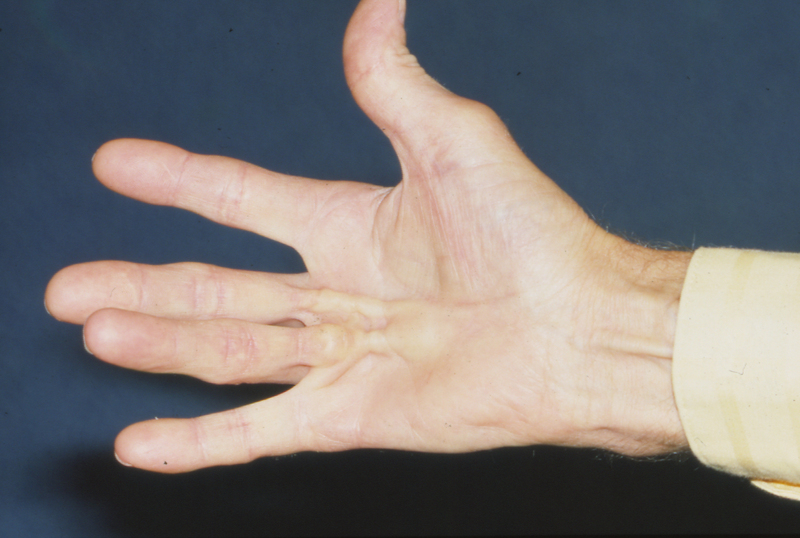 The cause of Dupuytrens contracture is unknown, but minor trauma and genetic factors appear to play a role. One or both hands may be affected, and the ring finger is affected most often, followed in frequency by the little, middle, and index fingers. 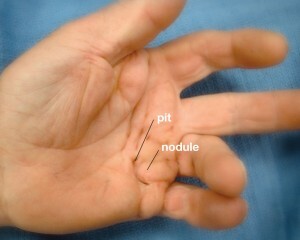 A small, painless nodule or thickening of tissue usually slowly develops in the connective tissue of the palm. Eventually it develops into a cord-like band that makes extension of the fingers difficult to impossible in the advanced stage of the disease. 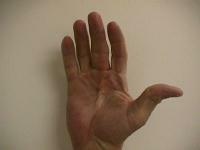 Dupuytren contracture occurs more often after the age of 40, and men are affected more often than women. people of northern European and Scandinavian ancestry are more likely to develop DC than other groups. Statistical risk factors, which are thought to be related from a metabolic standpoint, are alcoholism, diabetes, liver disease, and pulmonary tuberculosis, as well as treatment for epilepsy. A physical examination of the palm by palpation (or touch) confirms the presence of thickened scar tissue and characteristic contracture. 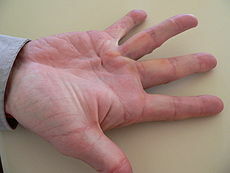 Restriction of of full finger(s) range of motion is most common. The disorder progresses at an unpredictable and variable rate; sometimes taking only a few months and other times taking almost a decade to develop fully. Surgical treatment can usually restore normal movement to the finger, but the disease will recur following surgery in a significantly high number of cases. 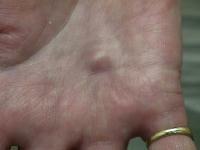 Hopefully, these Dupuytren’s pictures will be helpful to understand this problem. Perhaps they can motivate you see your medical doctor, and then get busy with aggressive use of multiple conservative measures to improve your changes for self-recovery. Please review the section, Dupuytrens Treatment, to determine how to incorporate the aggressive use of multiple conservative measures to treat the fibrous thickening. Please let DCI know if this section of the website is helpful to you, and feel free to contribute your own Dupuytren contracture picture to DCI for inclusion on this page. For ideas and suggestions to organize an effective Alternative Medicine treatment plan using safe natural products like vitamin E, PABA and acetyl-L-carnitine) , click Start a Dupuytren Treatment Plan. I have had DC surgery on both of my hands in the past 6 mos. On my right hand just over a week ago, 2/19/2019 and still have the stitches. Thanks for the information as I found this interesting. I have two lumps that have appeared over nine months ago in the palm of my left hand, my middle finger and ring finger are becoming more painful. My rheumatologist has told me its to do with having RA, not Dupuytren’s contracture. I was thinking of seeing my hand specialist, I also have had for over two years a frozen left shoulder with CRPS in it. Is there a connection? Will also the lumps get smaller? You ask some good questions. There are several possible problems going on concurrently, so this makes it more difficult to unravel each of them and to identify which might be more primary and those that might be secondary issue.